Naples is Italy's fourth most important city for economic strength, coming after Milan, Rome and Turin. It is the world's 91st richest city by purchasing power, with a GDP of $43 billion. Were Naples a country, it would have the world's 68th biggest economy, near the size of that of Qatar. 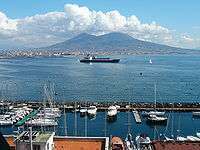 The economy of Naples and its closest surrounding area is based largely in tourism, commerce, industry and agriculture; Naples also acts as a busy cargo terminal, and the port of Naples is one of the Mediterranean's biggest and most important. The city has had a remarkable economic growth since the war, and unemployment in the region has gone down dramatically since 1999. Naples used to be a busy industrial city, though many of the factories are no longer there, and Naples is still characterized by high levels of corruption and organized crime. 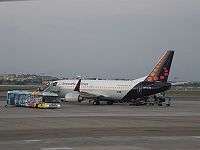 An airplane in Naples airport, in the August 2009. Naples also hosted important electronics industries such as Olivetti research department in Pozzuoli, now dismissed. Also Naples is important for its light aircraft industries Partenavia and Vulcanair (nowadays both firms belong to Vulcanair) and hosted several departments of big aircraft industries of Aeritalia. Aeritalia then joined with Selenia (that were a group of electronic and radar defense military industries) with the name of Alenia. Alenia is still present in Naples, but its production relevance is important but nowadays shrinking. The only relevant industry of Naples remains actually the Alfa Romeo automobile factory at nearby Pomigliano d'Arco; the word "Romeo" in the company name is a reference to Neapolitan engineer Nicola Romeo. Ship construction yards are present in territory of Naples, Pozzuoli and in Castellammare di Stabia (motor yachts, fishing boats and fishing ships) and also in Castellammare di Stabia is present a big shipyard called Cantieri Navali which is property of Fincantieri. One of the first large Italian companies producing canned vegetables, Cirio, was founded in Turin. Naples and the surrounding area also has a large number of smaller firms manufacturing canned vegetables, mostly tomato sauce. Family-sized pasta companies in Torre Annunziata collapsed around 1949-1950 due to the rise of industrial pasta makers in northern Italy. Only the slow food typical artisan-made pasta in Gragnano survived and it is one of the most apprecciated typical products of Naples surroundings. Fior di latte cheese is made in the territory of Agerola, Lettere and Gragnano. The wine industry is also prevalent in the Naples area, mainly in Gragnano, Lettere, Ercolano and Pozzuoli. Naples is also known worldwide for Neapolitan coffee made with the historical Neapolitan flip coffee pot, which then led to the creation of the espresso coffee machine and Moka Express coffee pot. There are still some little industries roasting coffee beans and producing ground coffee to be used with Neapolitan coffee machines. The picturesque and touristy port of Capri, just outside Naples. 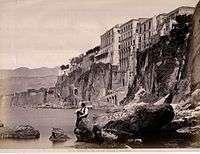 Hotels in Sorrento in the mid-1800s. Tourism is one of the biggest sectors of the Neapolitan economy, with the hotel trade sector compromising 3.7%. Naples is, and has always been, one of Italy and Europe's top tourist city destinations, with the first tourists coming in the 18th century during the Grand Tour. In terms of international arrivals, Naples came 166th in the world in 2008, with 381,000 visitors (a -1.6% decrease from the previous year), coming after Lille, but overtaking York, Stuttgart, Belgrade and Dallas. Despite this, however, there are far many more tourists who live in Italy, who visit the city, totalling its arrivals to several millions every year. Naples is popular due to its beautiful scenery, rich history, unique culture and interesting monuments and cityscape. Popular attractions include the Vesuvius, the Piazza del Plebiscito, the Teatro San Carlo, Naples Cathedral, and the city's several other monuments, churches, buildings, squares or piazzas and streets in general. 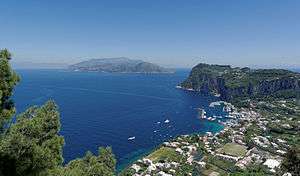 Many tourists who come to Naples also visit several popular attractions outside of the city, including the classical ruins of Pompeii (with 2,571,725 visitors in 2007) and Herculaneum, the scenic Amalfi Coast, including Sorrento, Amalfi and Ravello, the islands of Capri, Ischia and Procida, and the Baroque Royal Palace of Caserta. The port of Naples is one of the Mediterranean's most important. The economy is measured on a provincial level; the province of Naples is placed 94th out of the total of 103 provinces in Italy in terms of gross value added. Statistics do not include wealth generated by the black market or untaxed wages. It is not uncommon for Neapolitan workers to move North because unemployment is at around 28%. However, the unemployment level in Campania has been decreasing, and today is only 11.2%. The business centre of Naples is the Centro Direzionale. This was built only in recent times and features skyscraper technology designed by Kenzo Tange; it is an attempt to centralise and improve the business and economy of Naples, also providing jobs with its hotels and shops. ↑ "City Mayors reviews the richest cities in the world in 2005". Citymayors.com. 2007-03-11. Retrieved 2009-12-26. 1 2 "Site3-TGM table". Epp.eurostat.ec.europa.eu. Retrieved 2010-01-25. ↑ "Alfa Romeo - Company History". FundingUniverse.com. 2008-01-08. 1 2 3 4 5 "Rapporto sullo stato dell'economia della Provincia di Napoli". Istituto ISSM. 2008-01-08. ↑ "Lavoro: a Napoli disoccupazione al 28%". Intrage.it. 2008-01-08.